The record is made up of 1 file (94 folios). It was created in 21 Aug 1935-18 Feb 1936. It was written in English and Arabic. The original is part of the British Library: India Office The department of the British Government to which the Government of India reported between 1858 and 1947. The successor to the Court of Directors. Records and Private Papers. The file concerns a letter from Ibn Saud (also referred to as Bin Saud) [Abd al-‘Azīz bin ‘Abd al-Raḥmān bin Fayṣal Āl Sa‘ūd], King of Saudi Arabia, to Shaikh Abdullah bin Qasim ath-Thani [‘Abdullāh bin Jāsim Āl Thānī], Ruler of Qatar (also spelled Katr), concerning the Qatar oil concession and the Saudi-Qatar frontier. The letter demanded that the Ruler of Qatar should agree to fix the boundary between Qatar and Saudi Arabia; otherwise, Ibn Saud would be 'compelled to protest and to stop operations'. The suggestion of the Political Resident A senior ranking political representative (equivalent to a Consul General) from the diplomatic corps of the Government of India or one of its subordinate provincial governments, in charge of a Political Residency. in the Persian Gulf Historically used by the British to refer to the sea area between the Arabian Peninsula and Iran. Often referred to as The Gulf or the Arabian Gulf. (on folio 86) was that the means of preventing operations would be by fomenting tribal unrest. 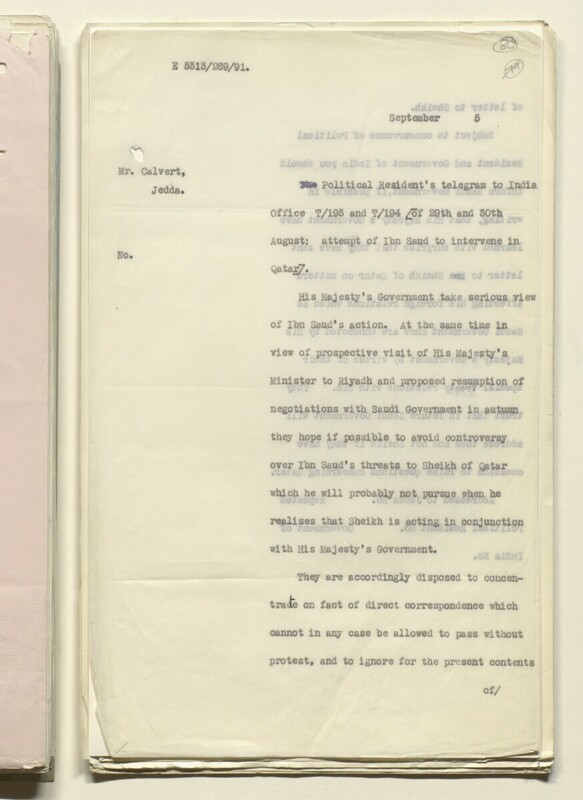 The papers discuss the British response to the letter, which resulted in a formal protest by His Majesty's Chargé d'Affaires, Jedda (Albert Spencer Calvert). The Foreign Office subsequently decided to close the matter until a settlement of the frontier question could take place. The papers include the text of Ibn Saud's letter or 'Mulhaq' (in Arabic, with English translation, folios 58-62); and correspondence from the Political Resident A senior ranking political representative (equivalent to a Consul General) from the diplomatic corps of the Government of India or one of its subordinate provincial governments, in charge of a Political Residency. in the Persian Gulf Historically used by the British to refer to the sea area between the Arabian Peninsula and Iran. Often referred to as The Gulf or the Arabian Gulf. , the Foreign Office, His Majesty's Chargé d'Affaires, Jedda, and the Government of India; and India Office The department of the British Government to which the Government of India reported between 1858 and 1947. The successor to the Court of Directors. minutes. Foliation: the foliation sequence (used for referencing) commences at the inside front cover with 1, and terminates at the last folio with 95; these numbers are written in pencil, are circled, and are located in the top right corner of the recto The front of a sheet of paper or leaf, often abbreviated to 'r'. side of each folio. A previous foliation sequence, which is also circled, has been superseded and therefore crossed out.